Knowledge plays a major role in the goal of achieving the 2030 Agenda for Sustainable Development, said Khaled Abdel Shafi, director, Regional Hub for Arab States, United Nations Development Programme (UNDP). He was speaking on the second day of the fifth annual Knowledge Summit, organised by the Mohammed bin Rashid Al Maktoum Knowledge Foundation (MBRF). The session was dedicated to the 2018 edition of the Global Knowledge Index (GKI), launched the previous day. The summit was held on December 5 and 6, at the Dubai World Trade Center, in Dubai, UAE. The panel brought together representatives from the United Nations Development Programme and Mohammed Bin Rashid Al Maktoum Knowledge Foundation, including: Abdel Shafi; Dr Hany Torky, chief technical advisor of the Arab Knowledge Project; and Jamal bin Huwaireb, MBRF’s chief executive. “Its application develops capabilities and expands opportunities in multiple sectors of our lives, from education to economy to technology,” he added. He added that under the umbrella of the partnership between UNDP and MBRF and within the Knowledge for All project, significant success was achieved over the years that led to expanding the scope of work to cover 134 countries in the 2018 edition of GKI. He stated that the UAE is headed for the vision 2030 and the results of the Global Knowledge Index proves that the UAE is on the right track. He also highlighted the critical role played by different educational sectors and its effect on the other sectors, namely innovation, technology and economy. The Global Knowledge Index serves as a roadmap for the sustainable development of societies. It helps countries in the region and globally to formulate a forward-thinking strategy to support knowledge and promote it as a main component in building a stronger knowledge economy while ensuring sustainable development. “This project shows the keenness of the UAE leadership and people to keep up with scientific development in preparation for the future,” Torky added. On the sidelines of this year’s event, the two-day summit also announced the winners of Literacy Challenge in the Arab World, an initiative to curb illiteracy in the region. 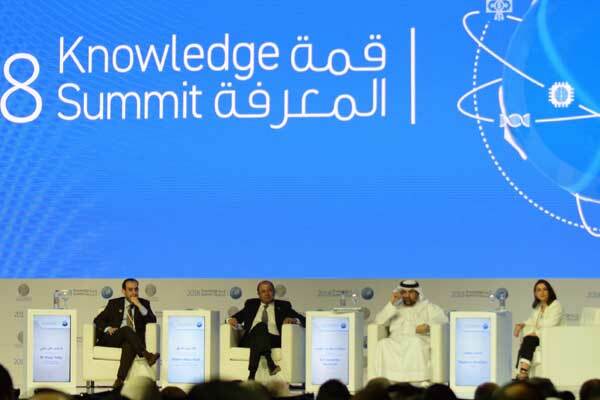 Organised by the Mohammed bin Rashid Al Maktoum Knowledge Foundation (MBRF), the fifth Knowledge Summit was held on December 5 and 6 at the Dubai World Trade Centre. The summit bore the theme “Youth and the Future of the Knowledge Economy” and tackled the topic of the knowledge economy in depth. The summit 2018 brought together over 100 speakers including experts, decision makers and stakeholders from around the world in more than 45 discussion panels.